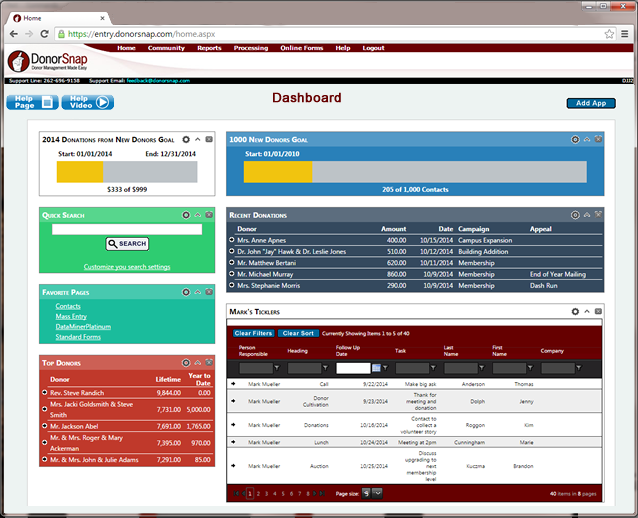 The Dashboard is the first page displayed upon logging into DonorSnap. This page provides a customizable interface to help you see an overview of your database as well as highlight tasks that require action on your part. To get started, click the button on the Right side of the screen, to bring up the app choices window. DonorSnap Goals can be set up for many different scenarios. 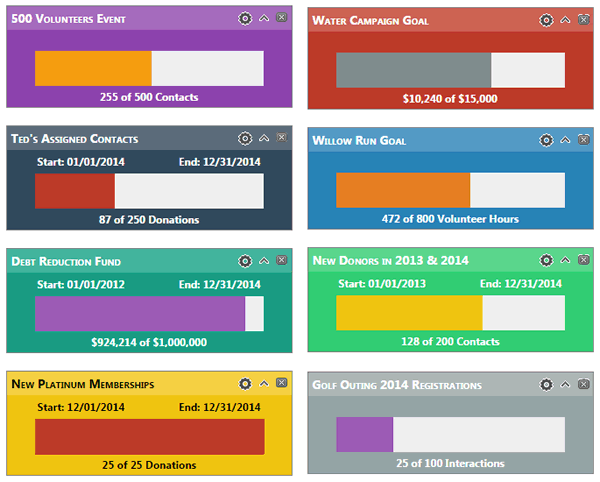 Create donation, volunteer, interaction, and contact based goals and track the progress on your dashboard. Goals can be kept private for a single user or can be shared among all users. For more help on selecting the right settings, take a look at the Goal Definitions Page. This grid highlights the settings selected in the app setup. By default, the app will display all tickler items that have not yet been completed, but it can be customized to display items only pertinent to you. The above example has been set up to display only Mark’s tasks that have not yet been completed. 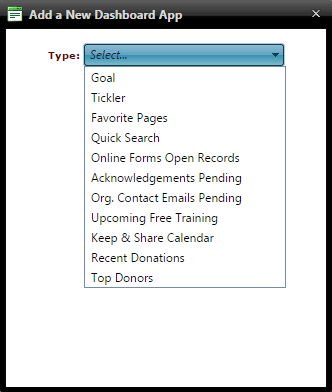 Ticklers are added on the Tickler tab of each Contact record. From the dashboard, open the pending Tickler by clicking on the arrow icon on the left adjacent to the Tickler item you’d like to visit. 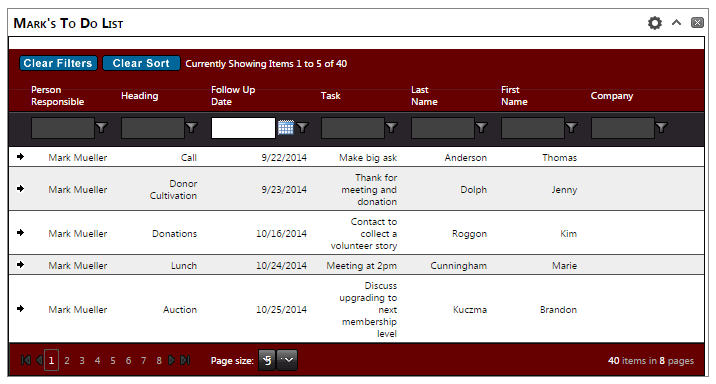 Use the Tickler system to remind you about tasks relating to specific Contacts. In addition to the Tickler system highlighting open items on the Dashboard, the system can generate automatic reminder emails to notify you of past-due tasks. The Favorite Pages app allows you to create shortcuts to any page in DonorSnap. If you find yourself going to a few key pages on a daily basis, you might be interested in adding them to a favorite pages app. Another idea is to add multiple favorite pages apps for different scenarios. Create one for your daily tasks and one for your year end reporting. The Quick Search app allows you to quickly search any of the fields in your database at the same time. By default it will search every field in your database, so you’ll want to make sure to customize your search settings. Select only the fields relevant to what you will most often be searching including name, address, user defined fields, etc. The Acknowledgements Pending app displays all of the donations that are currently not acknowledged. 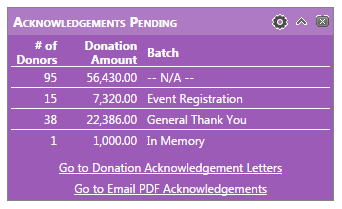 See at a glance which batch codes need processing along with the number of records and the total donation amount. Click one of the two links below the chart to go directly to the processing page. If you do not have Email PDF Acknowledgements enabled for your user account, the shortcut link will not be displayed. If your organization is using the Email notification system to alert key organization members of donations made by designated contacts, this app will display whether or not Emails are ready to be sent out. To process these emails, use the shortcut link at the bottom of the app or go to Processing–>Organization Contact Email and select the Generate Email option. Wednesday Webinars, always at 1pm ET. Always Free. Anyone can attend. 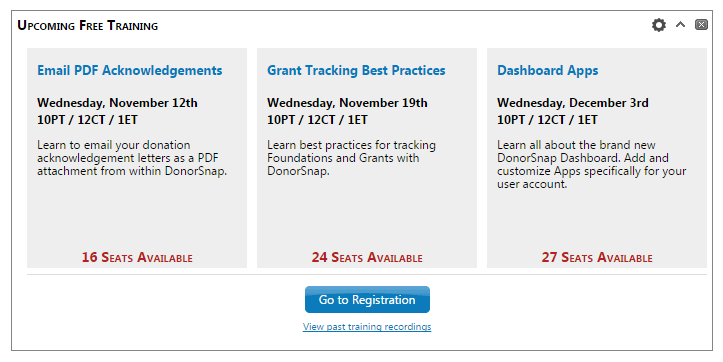 Stay informed about the upcoming free training webinars. Register by clicking on the button or use the shortcut below it to watch any of the past training recordings. If you’re using Keep&Share, DonorSnap will allow you to display a calendar from your account through this integration. 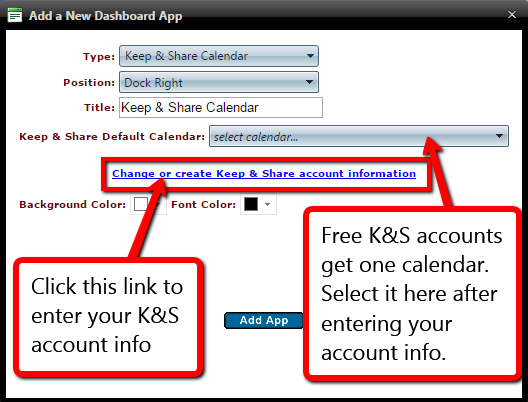 Add your Keep&Share account login and then select which calendar you’d like to display. The Recent Donations app shows you all of the most recently made donations. In the settings, you can determine how many records show or filter it to only show records of a certain campaign, appeal, accounting code, etc. This app can be displayed in either the right or left column of your dashboard. When it is positioned on the left, only the first three columns will be displayed. Click the arrow icon on the left to jump directly to that donation record. The Top Donors app will show you the contacts with the highest donation totals. Adjust the time frame and the columns in the settings. This app can be displayed in either the right or left column of your dashboard. When it is positioned on the left, only the first three columns will be displayed. Click the arrow icon on the left to jump directly to that donation record. The Pledge Report app allows you to see at a glance the pledge and non-pledge donations given toward a campaign, appeal, or accounting code. Each app can categorize pledges and donations based one of those three fields at a time. The optional date range will select non-pledge donations based on the Donation Date and pledge records based on the Pledge Date. Only these pledge records will be reflected in the pledges collected/outstanding columns.